Makes a large pot- I freeze what I don’t want to eat immediately in portions for quick midweek meals. Again, apologies for the lack of quantities- I just grabbed the veg in this week’s box! Fry the onion and garlic in the oil until soft. Add chilli powder to taste (I like a spicy chilli so put 2-3 tspns) and stir to stop it sticking. Add the remaining veg in order of firmness, e.g. 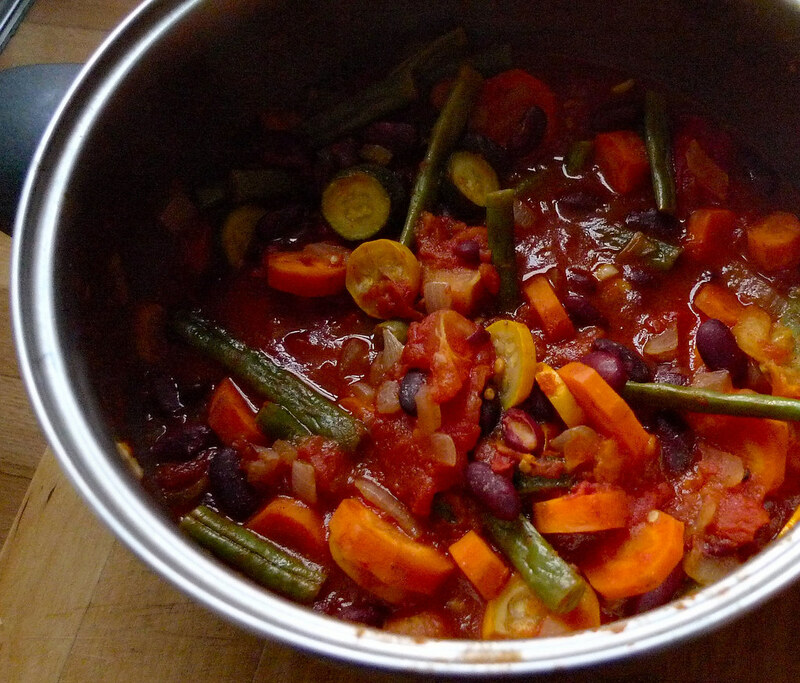 carrots, then courgettes, then beans, then tomatoes, and cook for a few minutes each time. Drain the kidney beans in a sieve and rinse in fresh water. Add to the pot along with the tinned tomatoes. Bring to simmering point, season to taste, cover, and simmer for 15-20 mins. Taste and adjust seasoning/chilli to suit.